Allistair Holland had been increasingly concerned by the number of homeless people he saw in Melbourne’s CBD. 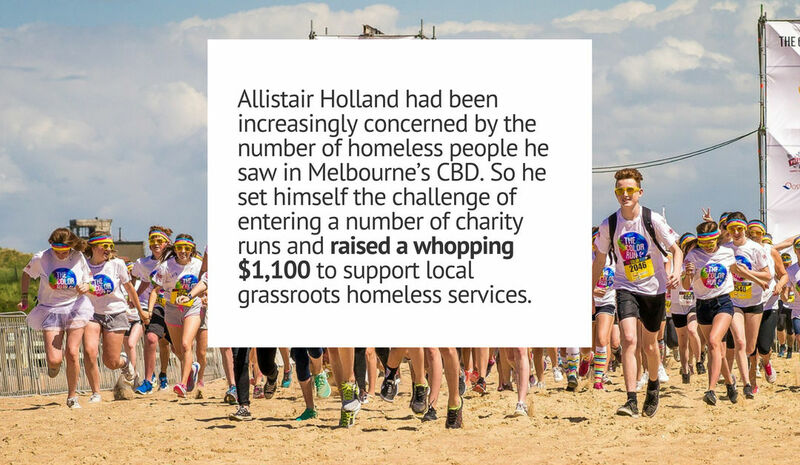 So he set himself the challenge of entering a number of charity runs and raised a whopping $1,100 to support local grassroots homeless services. Jamie Wolf owns Myrtle Ivy Café and each year supports CafeSmart but he wanted to do more. In 2017 he held a charity basketball game ‘Hustle for the Homeless’ and asked his mates to organise teams, get involved and donate. His event and MyCause campaign raised over $1,500. 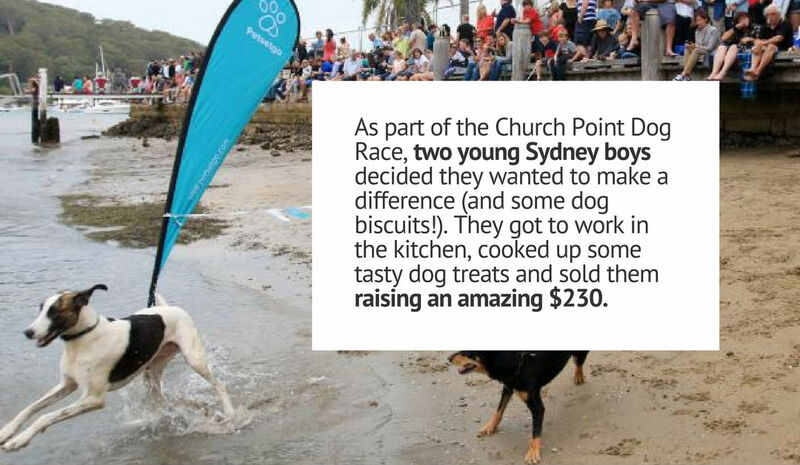 As part of the Church Point Dog Race two young Sydney boys decided they wanted to make a difference (and some dog biscuits!) They all got to work in the kitchen, cooked up some tasty dog treats and sold them raising an amazing $230. Glen Waverley Secondary College community raised a huge $1,215 by holding a casual dress day. Students had the opportunity to learn more about homelessness, and how to help out those in need. We offer an easy way for your businesses, your staff, and customers to make a positive contribution to the community, helping to tackle homelessness at the local level. Your workplace can implement workplace giving, sponsor our events tailored to your needs, as well as one-off fundraising events to get your team motivated. 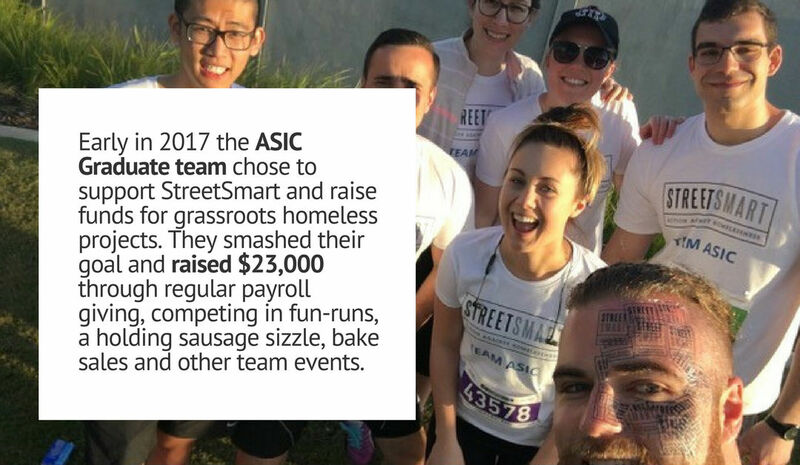 Early in 2017 the ASIC Graduate team chose to support StreetSmart and our work to support and fund grassroots homeless projects. They smashed their goal and raised $23,000 through regular payroll giving, competing in fun-runs, a holding sausage sizzles, bake sales and other team events. Arbeth Hill are a small accounting firm and wanted to make a commitment to helping tackle the issue of homelessness. Each month they donate a percentage of their profits and have so far donated over $2,400. With the support of over 900 cafes and restaurants all over Australia, we have raised more than $4.8 million for grassroots projects directly assisting people who are homeless. You can participate in CafeSmart, DineSmart and you can join StreetFunder with your own fundraising initiative. G’Day Tiger offered a filter coffee and tasty toastie special on Christmas day and raised over $900. 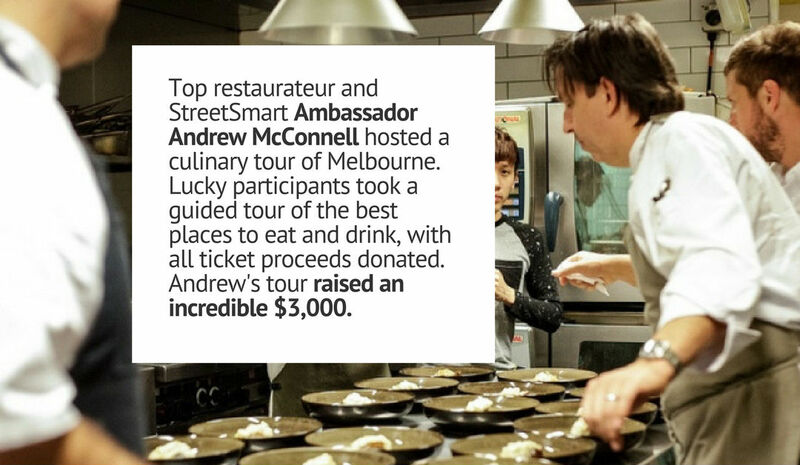 Top restaurateur and StreetSmart Ambassador Andrew McConnell hosted a culinary tour of Melbourne and raised an incredible $3,000. 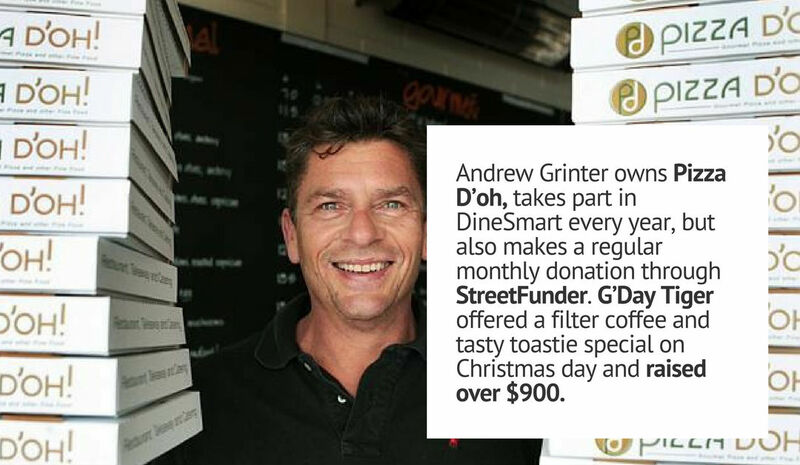 Andrew Grinter owns Pizza D’oh, takes part in DineSmart every year, but also makes a regular monthly donation through StreetFunder. For small projects with little government funding, people like you can make the world of difference. If you have a fundraising idea, and want to support great homelessness projects you can get started by creating a page on MyCause or if you need more help just get in touch with Geoff to chat about how we can #HELPYOURHOOD. We are here to partner with you and make it a success!